Where, Then, Shall We Go? It is still illegal to be homeless and without a shelter bed in the city of New Haven. On the one hand, there are not nearly enough shelter beds for the 1,400 people that Columbus House reported sought emergency housing from them this year. Moreover, during the summer months, with the closure of the Overflow Shelter and the reduction of the number of beds at Grand Avenue, homeless people are essentially legislated into sleeping outside. On the other hand, the city is not willing to allow these same people, that it has turned away, to camp on public land or take refuge together. They demonstrated this on May 16, when they evicted former overflow shelter residents from 211 Rosette Street, an unused public lot where they had set up camp. The only place where homeless people are allowed to live is on the New Haven side of the West River, which is subject to frequent flooding and mosquitos, is far from emergency services and where police still occasionally arrest people for sleeping outside. Our community is not going to stop asking the question, however and until we get a decent answer, we are going to continue to engage in nonviolent direct action to defend the human rights of our community to safe-accessible housing. On July 24, we are planning to march from the Catholic Worker to an undisclosed piece of city property, which we will appropriate in order to extend hospitality to those whom the city has left without a roof over their heads. We invite people of faith and conscience, activists, allies and members of the public to join us in this action, and to support it with donations of food and camping supplies and by pledging to march with us on the 24th and/or to spend one or more nights defending the site that we choose from being dismantled. IMMEDIATELY end practices that criminalize homeless people who have no shelter bed and seek refuge outdoors. Order police not to arrest or interfere with homeless people who choose to set up shelters for themselves on public land, in parks, or on the New Haven Green. IN THE SHORT TERM restore all of the shelter beds that New Haven has lost since this winter, both through the closure of the Overflow Shelter and the reduction of the number of beds at Grand Avenue. Do this either by reopening the overflow shelter or by creating a new, publicly run facility. IN THE LONG TERM create a city and neighborhood development plan that puts low income and affordable housing at the center of the “vision” for the city. This means guaranteeing the “1 for 1 replacement” of all low income housing that is redeveloped and passing “inclusive zoning” laws to ensure that all new housing in a given area will contain a particular percentage of low income housing. None of these steps are difficult. None of them are new, since all of them have been modeled in other cities and some of them (like keeping the overflow open year-round) have even been previous public policy in New Haven. 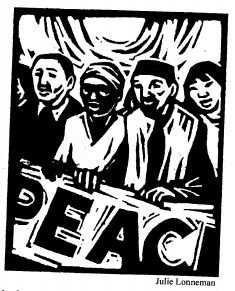 We at the Amistad Catholic Worker are eager to begin working together with the Mayor and the entire municipal government in caring for everyone in New Haven who has been deprived of their human right to housing, but meeting the legitimate demands of our homeless brothers and sisters to immediate safety, supportive refuge and freedom from criminalization is an essential first step which the city can no longer ignore. Toward that end, we will not remain silent but will continue to take direct action. On July 24th, we will once again be claiming a piece of unused city-owned property for the refuge of those who have no place to go. We call upon the City of New Haven to either respect this action as the right of the people, or to take the immediate steps themselves to make it unnecessary. The Amistad Catholic Worker is a community of faith dedicated to the daily practices of the Works of Mercy, voluntary poverty, personalism and prayer. Located in the Hill neighborhood of New Haven, Connecticut, our home is open as a house of hospitality offering sustenance and companionship We seek to be a safe haven and a public nonviolent witness in our neighborhood, and always try to blur the distinction between the people who are serving and those being served. Please contact Gregory Williams (203-440-6696 gregory.williams@yale.edu) or Mark Colville (203-415-5896 amistadcw@yahoo.com) for more information or to get involved in this effort.